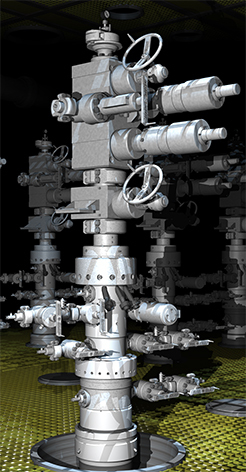 Dril-Quip offers Surface Production Trees utilizing a stacked valve configuration for land or platform completion systems. The systems are designed and assembled to meet customer specifications. Both valves and components are manufactured to meet API specifications. Dril-Quip's solid block valves are a popular choice for offshore platform completions where conserving space and minimizing leak paths are important. Dril-Quip block valves are manufactured to API specifications.